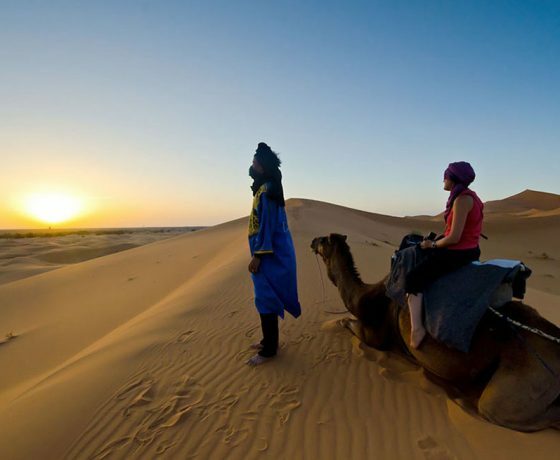 A tour that will take you from your hotel in Marrakech and introduce you to the desert, villages and the mountainous regions of the great Moroccan Sahara. 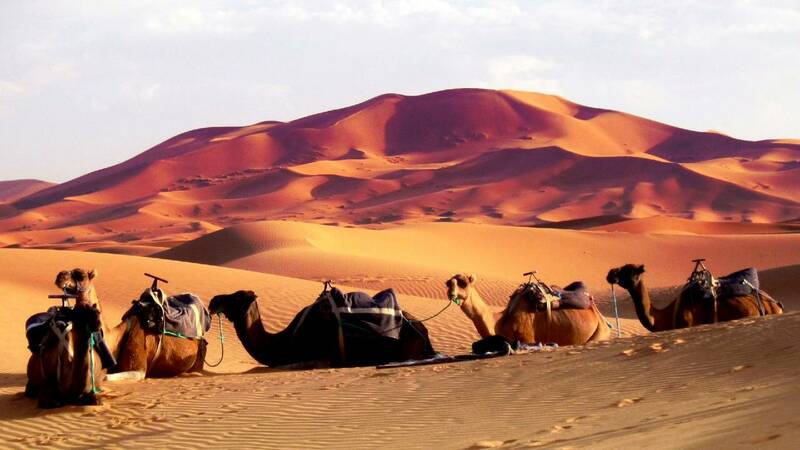 On this tour you will experience high mountain passes where views will be witnessed across several miles, Kasbahs, a camel trek in Merzouga over the Erg Chebbi Dunes. There is nothing more spectacular than an overnight stay in a Bedouin desert camp. 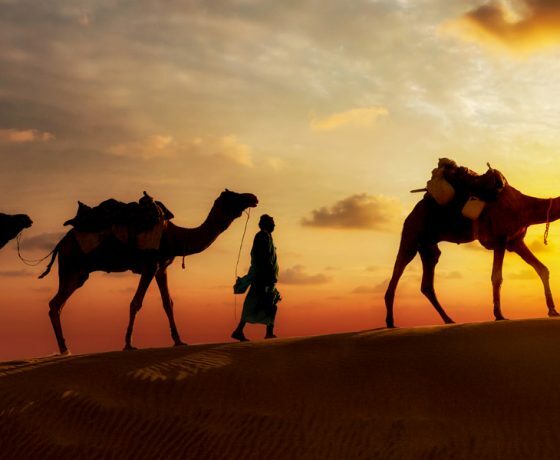 This allows you and the shared party you are with a chance to star gaze into the sky, watch the sunset and rise when on a camel ride and see hundreds of Kasbahs. The conclusion of this shared tour will end in the magical city of Fes. 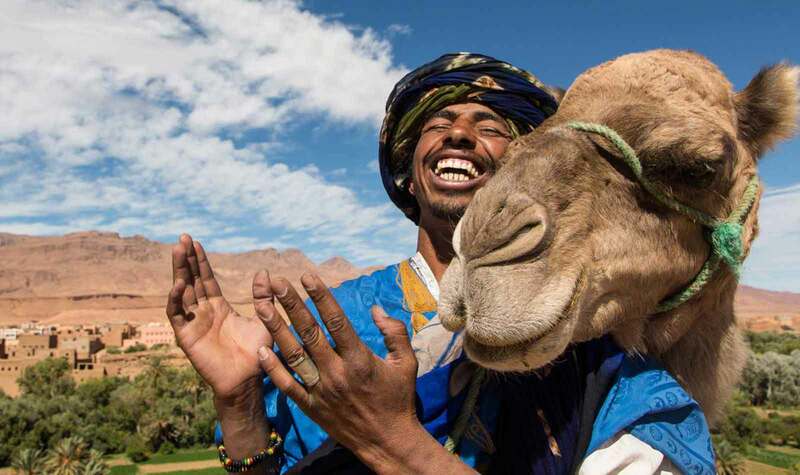 This opening part of the tour will collect the shared party from the designated pick up points in Marrakech and driving through the High Atlas Mountains. Here the roads are often steep and the views are stunning. 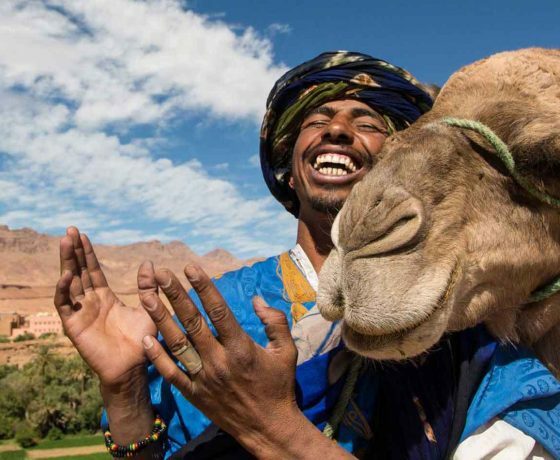 It will be a six hour drive from Marrakech to the Dades Valley. We then descend to the World Heritage Site of the Kasbah at Ben Ait Haddou. Much of the market will be guided and there are many fascinating wares to behold within the walled souk area. We will drive across the desert oasis at Skoura and visit the Valley of the Roses. Our tour then ascends along the road where you will witness the 1001 Kasbahs. The first night is spent in a luxury hotel in the Dades Valley. Dinner is served and at the Dades Valley Vieux Chateau Hotel. The second day of this adventure begins with a hearty breakfast at the hotel before taking a four hour drive to Merzouga. Along the route there will be a chance to stop at the small town of Tinghir, take a walk through the Todra oasis and then onto the canyons before visiting two more towns at Erfoud and Rissani. 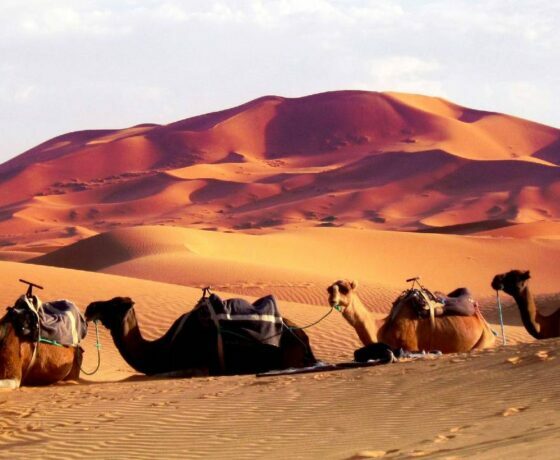 When we arrive at our destination in Merzouga, we will be met by a camel caravan. 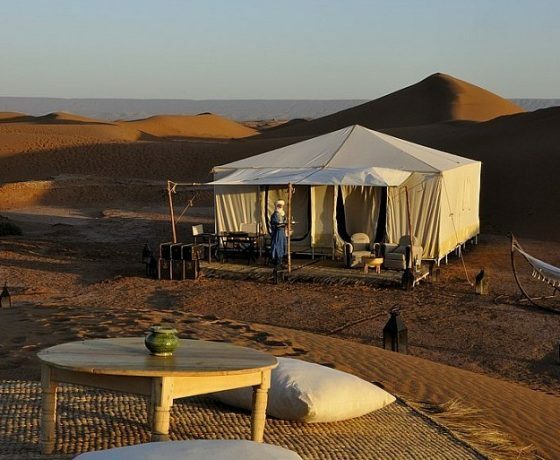 At this stage there will be an hour long ride through the Erg Chebbi Dunes where the trek will coincide with the setting of the Saharan sun. 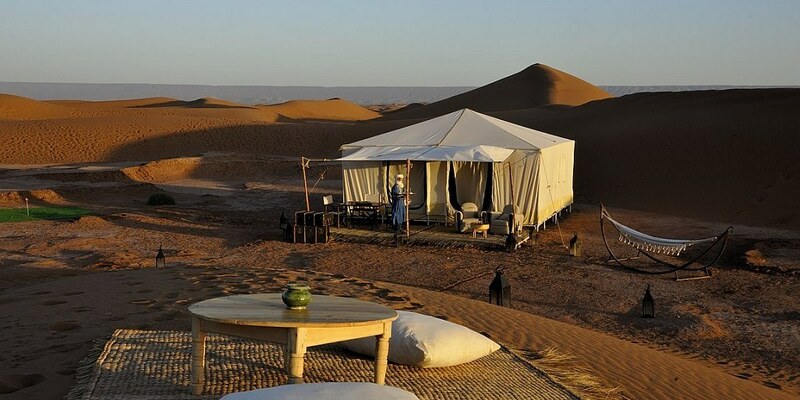 We will then camp over in a Bedouin desert camp. 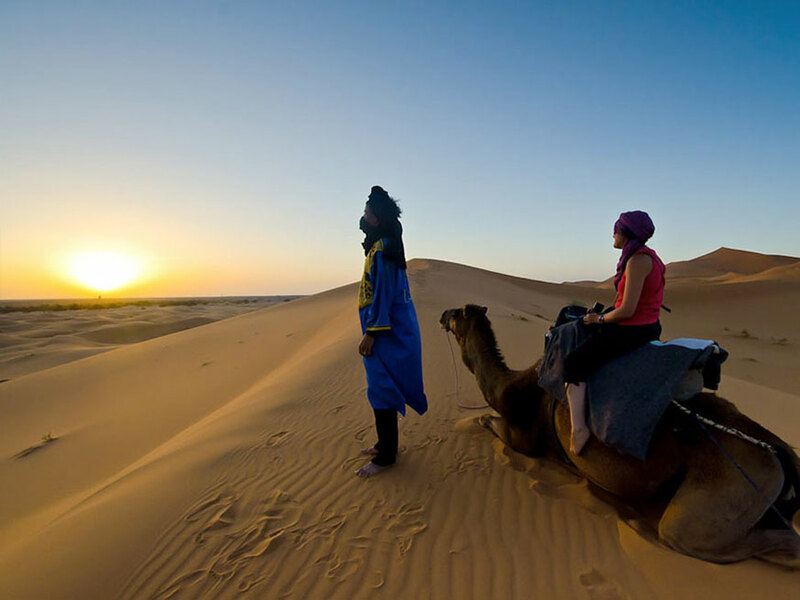 The third day on this intrepid tour of the Moroccan desert will see us enjoy Merzouga. We will have breakfast at the hotel, an opportunity to swim in the hotel pool, free time to explore the activities on offer in the desert area and enjoy an overnight stay in the hotel with a fine dinner to round the day off. There are plenty of activities like quad biking, buggy riding across the dunes and biking but these will be at your own expense. We rise early to witness the sunrise and then enjoy breakfast before stopping off in the City of the Apples: Midelt. Ifrane, or Little Switzerland is our next stop on the way to Fes before arriving in the big city for our tour’s conclusion at around 18h00.